The distinction between out-performance of an Investment fund or plan manager vs rewards for taking risks is at the heart of all discussions on Investment fund performance measurement of fund managers. This issue is not always well-understood and the notion of risk adjusting performance is not universally accepted. Performance Measurement in Finance addresses this central issue. The topics covered include evaluation of investment fund management, evaluation of the investment fund itself, and stock selection performance. The book also surveys and critiques existing methodologies of performance measurement and covers new innovative approaches to performance measurement. The contributors to the text include both academics and practitioners providing comprehensive coverage of the topic areas. 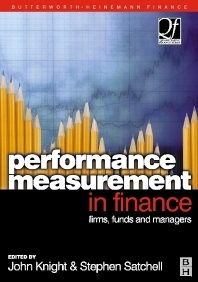 Performance Measurement in Finance is all about how to effectively measure financial performance of the fund manager and investment house managers, what measures need to be put in place and technically what works and what doesn't. It covers risk, and what's acceptable and what isn't, how, in short, to manage risk.